The Department of Justice announced Wednesday that it had prosecuted more violent and firearm crimes in FY 2018 than in any prior year on record. This conclusion is based on new data from the Executive Office of United States Attorneys, documenting the number of defendants who had been charged by federal prosecutors in the preceding year. In total, 81,800 people were charged in FY 2018, a 15 percent increase over the preceding year. "President Donald Trump is a law-and-order president—and this is a law-and-order administration," said Attorney General Jeff Sessions. "The Department of Justice is breaking law enforcement records and doing so by significant margins. When I took office as attorney general, I ordered federal prosecutors and agents to take illegal guns off of our streets, to prosecute crimes aggressively, to protect our nation's borders, and to target white collar fraud." Violent crime prosecutions accounted for about one in five prosecutions, totaling just under 17,000. That represents a 15 percent increase on FY 2017, which itself was a record-breaking year for violence prosecutions, according to the DOJ. 15,300 people, meanwhile, were charged with federal firearms defenses, up 17 percent from the previous highest number of prosecutions. The increase in these prosecutions reflects Sessions's aggressive focus on curbing the murder and violent crime rates, which both rose notably in 2015 and 2016. Recent data from the Federal Bureau of Investigations indicate that both rates fell slightly in 2017, a success which Sessions attributed to his crackdown. "Violent crime and homicides, which jumped in 2015 and 2016, both dropped in 2017 and will drop again in 2018," he said Wednesday. "There can be no doubt that good law enforcement policies can make our communities safer." Of course, violent offenders were not the only targets of federal prosecutors. 68,400 people were charged with illegal entry (i.e. border crossing) in FY 2018, an 86 percent increase over the preceding year. This likely reflects the Department's "zero tolerance" policy, which calls for the prosecution of first-time crossers in order to curb illegal immigration. A further 23,400 were prosecuted for illegal reentry, up 38 percent over FY 2017. Lastly, 23,600 defendants faced drug-related charges, a six percent increase over 2017. 99 percent of all federal drug offenders are incarcerated for trafficking, with the increase likely reflecting an increased focus on dark-net drug smuggling from China. 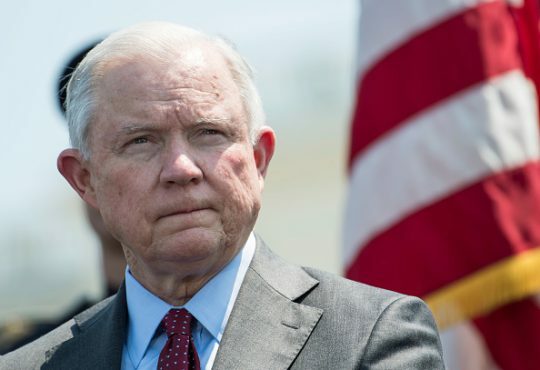 6,500 defendants were charged with white-collar offenses, up three percent over 2017; however, the Transactional Records Access Clearinghouse at Syracuse noted that total white-collar prosecutions have fallen to historic lows under Sessions's administration. This entry was posted in Issues and tagged Jeff Sessions, Justice Department. Bookmark the permalink.